French President Nicolas Sarkozy greets greets U.S. Republican Presidential hopeful, Senator John McCain, upon his arrival at Elysee Palace, Paris, France, March 21, 2008. If Senator John McCain wasn't the secret favorite of French President Nicolas Sarkozy among all American candidates to the White House, he certainly should be now. In comments to the press following their meeting at the Elysée Friday, McCain spoke in such high praise of Sarkozy that it seemed as though he was on the stump for the Frenchman's re-election rather than acting on his own political ambitions. Indeed, McCain was so laudatory of Sarkozy's actions and role in improving the ties between the two nations that he predicted "our relationship with France will continue improving now no matter who becomes President of the United States." McCain's huddle with around 40 journalists in the courtyard of the Elysée Palace only avoided becoming a full-out love fest due to one reason: Sarkozy wasn't there. Like British Prime Minister Gordon Brown in London the previous day, Sarkozy did not accompany his guest beyond the threshold of his official residence, presumably to avoid giving the impression he was supporting McCain's campaign in the event the compliments began flowing in great gushes. It was probably a wise move. By the time he was through, McCain had praised Sarkozy's leadership in environmental issues, pushing the harder international line against Iran's nuclear ambitions, and fighting terrorism. McCain called Sarkozy a "man of enormous energy" who has been central to bringing Franco-American relations into "an era of friendship and cooperation." Indeed, McCain was so generous in his applause of Sarkozy  whose tumbling approval ratings of 38% at home could use all the lift they can get  that at one point he appeared to inadvertently tip a diplomatic hand France has yet to play. Acknowledging Sarkozy's support and commitment to international peacekeeping and combat missions, McCain stressed the importance of "France's military participation in Afghanistan ... and of the brave forces of this country in fighting the Taliban." 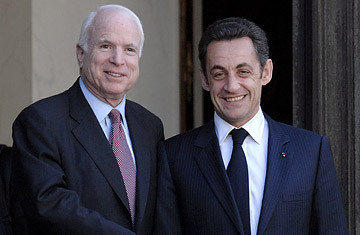 As part of that, McCain also thanked Sarkozy for "agreeing to send additional" troops to Afghanistan. That comment appeared to confirm unofficial reports that French president is planning announce his decision to increase France's Afghanistan contingent of 1,600 soldiers. The move  if it is indeed made at next month's NATO conference  would come in the wake of vigorous U.S. demands that its allies make a greater contribution to the Afghan effort. It could also possibly renew complaints in France that Sarkozy has tailored French foreign policy to please American politicians. But while his warm words undoubtedly caused Sarkozy's ears to tingle warmly when they reached him within the Elysée, McCain made it clear elsewhere he was in Paris on a mission of his own. Flanked by fellow Senators Joe Lieberman and Lindsey Graham, McCain noted they'd undertaken their week long fact-finding tour of Iraq, Jordan, Israel, England and France as members of Congress's Armed Services committee  not as some sort of campaign foreign road show. Perhaps, but discussing international affairs with foreign leaders and enhancing McCain's presidential hopes aren't mutually exclusive. Still, McCain acted the apt pupil. "I wish every senator, every senator would make this same trip," McCain said, noting several of the first-hand educational experiences he'd gotten. "They'd be better informed." Like Britain, France is abuzz with the Obama-mania wafting across the Atlantic . But McCain had a few crowd-pleasing cards up his sleeve as well. Responding to one long-winded inquiry on his Middle East views, for example, McCain amused listeners by jokingly reminding the reporter, "you're only allowed five questions." Conversely, when asked if either or both of his congressional travel mates might also happen to be potential running mates, McCain paused briefly as a snappy answer visibly lit up his face  then fade. "I was going to make a funny remark," McCain said, almost as if he foresaw a YouTube loop in his head. "But it seems like you're not supposed to do that anymore." His mix of quips, conviction, and clear interest in international affairs sent the assembled French and international journalists away largely impressed from their 15 minutes with McCain. By playing the welcoming, if invisible, host at this juncture, meanwhile, Sarkozy has ensured himself an equally warm White House reception should McCain prevail next November.